Eli Valley is not a suburb of San Francisco. 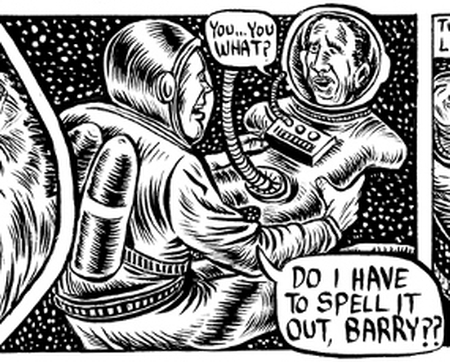 No, Eli Valley is a vicious Israel- and Jew-hating cartoonist who draws things like the panel above, in which Bibi Netanyahu rapes Barack Obama in outer space, after first eating his arms and legs. Apparently, the liberal Jewish Daily Forward, of which Valley is “artist in residence,” didn’t have the balls to publish this particularly emetic example of his work, so it appeared on the extreme anti-Zionist +972 website. Eli Valley’s message is simple: Israel is an apartheid state, ruled by neo-fascists and fanatical religious fundamentalists. American Jews that support Israel are either dupes, or are cynically exploiting the fear and ignorance of other Jews to rake in the dough. The Jewish establishment in the US pushes the party line of Israel’s “right-wing” government, and viciously clamps down on dissent. Meanwhile, the Likud regime continues to victimize Palestinian Arabs and shun peace while manipulating — with the help of fundamentalist Christian fanatics — the US government, in best Elders of Zion fashion. Valley’s style is imitative of R. Crumb and of 1950’s horror comics, although he doesn’t have the artistic talent of Crumb or Jack Davis, Will Elder, etc. His politics aren’t original either, being straight out of the Peter Beinart / J Street book. 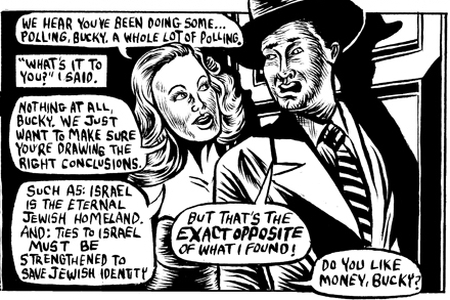 Much of the humor in his work comes from deliberate shock or vulgarity, as in the Bibi and Obama strip. Someone could try to explain Valley’s animus in terms of his biography: divorced parents, father a rabbi, etc. But who cares? It’s the essential characteristic of his work. Ironically, in addition to his gig at the Forward, Valley has a day job as a writer and editor for The Steinhardt Foundation for Jewish Life, an organization created by hedge fund billionaire Michael Steinhardt, one of the founders of Birthright Israel. And another major contributor to Birthright ($100 million) is none other than “casino mogul” Sheldon Adelson! But there’s more. One of the projects of the Steinhardt Foundation is called the Steinhardt Social Research Institute, which engages in exactly the same kind of research as Bucky Shvitz. And Steinhardt-funded research just happens to show that Jewish identity is positively related to support for to Israel. These findings directly contradict the argument of Peter Beinart that young American Jews are repelled by the reality of today’s Jewish state. In other words, the same organized Jewish community that Valley attacks in his cartoons as corrupt, the very community that does see identification with Israel as the path to preserving Jewish identity, is Valley’s meal ticket! And Valley’s cartoons not only attack the research funded by his employer, but even suggest that researchers have been bribed to reach pro-Israel conclusions! This is one confused little anti-Zionist. This entry was posted on Monday, May 14th, 2012 at 2:56 pm and is filed under General. You can follow any responses to this entry through the RSS 2.0 feed. Both comments and pings are currently closed. This is a disgrace. My guess is that if Steinhardt knew about Valley , Valley would be not working again at ‘Jewish Life’. Should I tell him? I’m serious — my wife says yes, but it’s an issue of parnassah.